The aim of a Full Condition Survey, commonly known as a Pre-Purchase Survey is to identify and detail the yacht’s defects, so for a new buyer help them decide if they wish to proceed with the purchase of their chosen yacht. The Full Condition Survey is normally carried out once a new buyer has decided which yacht that want. If a new buyer is still undecided the much less detailed Appraisal Survey could be considered, this survey only gives a superficial overview of the yacht’s condition so is always followed by a Full Condition Survey before any purchase. The Full Condition Survey is recommended if; you are buying a second hand narrow boat or yacht, having your new vessel handed over after delivery or having your yacht returned after the end of contract with a Charter Company. BMSUK have carried out Full condition surveys internationally and throughout The Eastern Mediterranean, the Middle East and Europe including France and the UK. Surveys have been carried out on all types of vessel including; inland waterways craft, sailing yachts and power boats both large and small and yachts constructed of various materials including; GRP, wood, steel, aluminium and composite. Each type of vessel and construction material requires a specific approach and equipment. BMSUK carries out full condition surveys in accordance with internationally recognised codes of practice drawn up by the international surveying organisations. All our surveyors are experienced, hold qualifications in marine surveying and are members of surveying organisations including; International Institute of Marine Surveying (IIMS) or The Yacht Designers and Surveyors Association (YDSA). Our rates are competitive, fill in the online survey enquiry form for a quotation. In our history of surveying we have had no customer disappointed when they have had a Full Condition Survey, either because they sail or motor away with confidence in their newly purchased yacht or happy that they have not proceeded with the purchase and taken on previously unforeseen yacht repairs. Generally for yachts up to and around 12 metres or about 40 feet and all narrow boats the survey can be completed in one full day however it does depend on the type of yacht and equipment onboard. For yachts over this length the survey can run over two or more days. 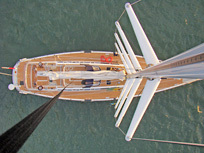 BMSUK full condition surveys can include a sea trial on all vessels and aloft rigging inspections can be arranged on sailing yachts (if safe to do so). The Full Condition Survey is carried out in three parts: In water inspection, sea trial then lift of the yacht followed by out of water inspection.